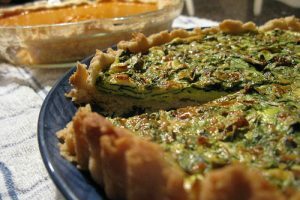 This is the best time of year for enjoying comforting dishes with complex flavors and savory herbs. Wouldn’t you agree? All I can say is that this is an entree that doesn’t doesn’t disappoint on any of those fronts. 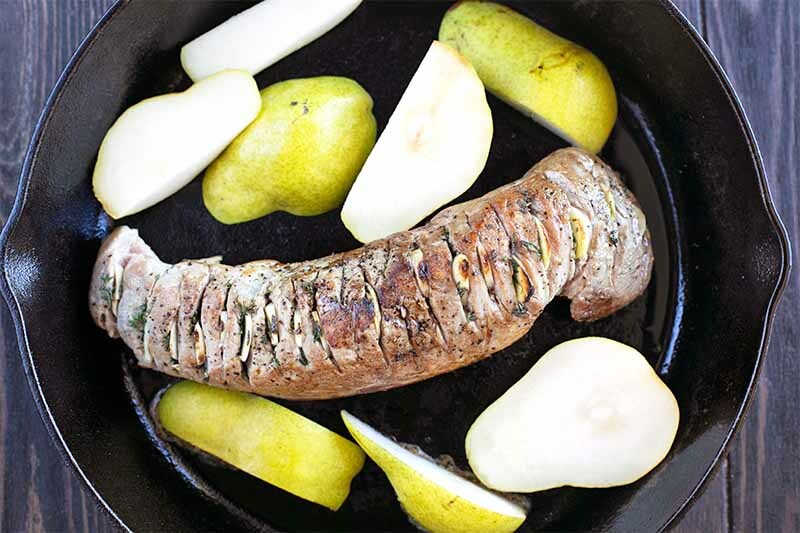 I have to start by pointing out the Hasselback treatment of the pork tenderloin itself. 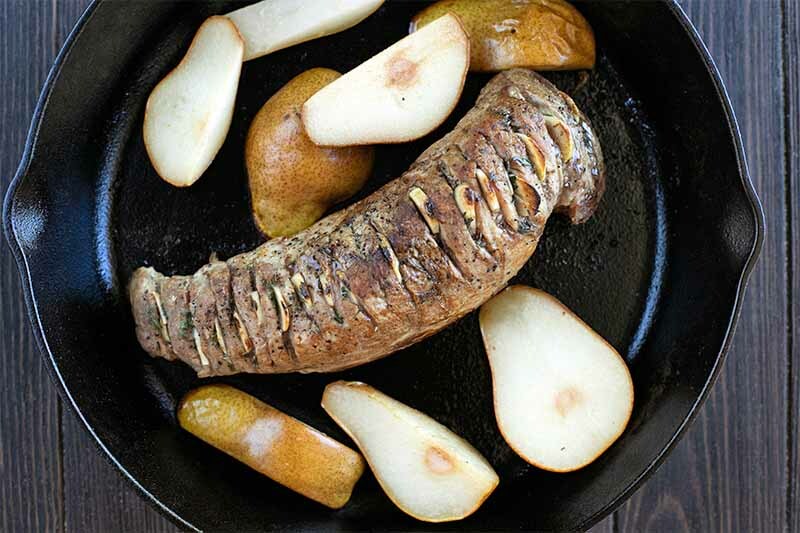 If you know anything about, or have ever made, a Hasselback-style recipe, you know it’s characterized by the small slits you make in a meat or vegetable, in order to stuff flavorful ingredients inside. 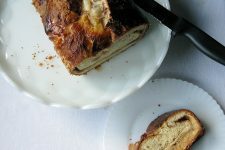 The first time I made a recipe with this type of treatment, it was a baked potato with thin accordion or fan-like slices, and slits stuffed with cheese. 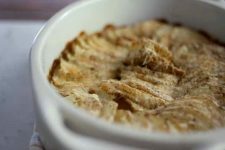 As the story goes, a few hundred years ago a similar potato dish was featured at a hotel restaurant known as Hasselbacken in Sweden, and the method has gone in and out of fashion ever since. I loved how the simple technique evenly distributed the cheese throughout the potatoes, ensuring that every bite was rich and flavorful. 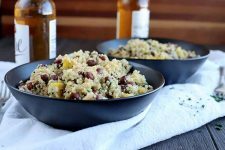 And that’s exactly what you get in this recipe – an even distribution of flavor that really packs a punch for your taste buds. 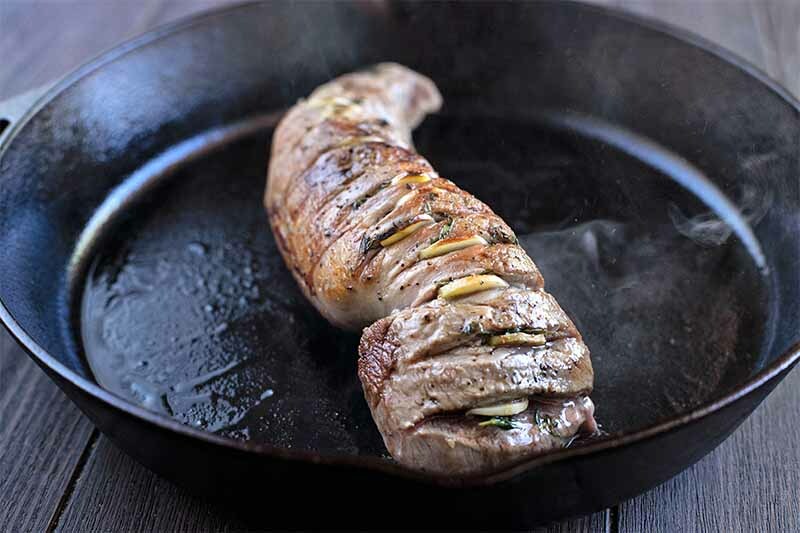 I had never tried the Hasselback method on meat before, but I am convinced it is the only way to eat pork tenderloin from now until forever. 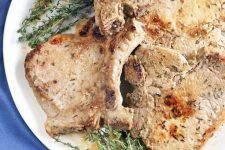 This particular recipe provides a sliver of garlic and a sprinkle of thyme leaves in every single cut, making the garlicky herbaceousness seep into the meat throughout the cooking process. You might think such a gorgeous dish is somewhat difficult to make, but it’s honestly a simple recipe that you can follow along with just a few easy steps. 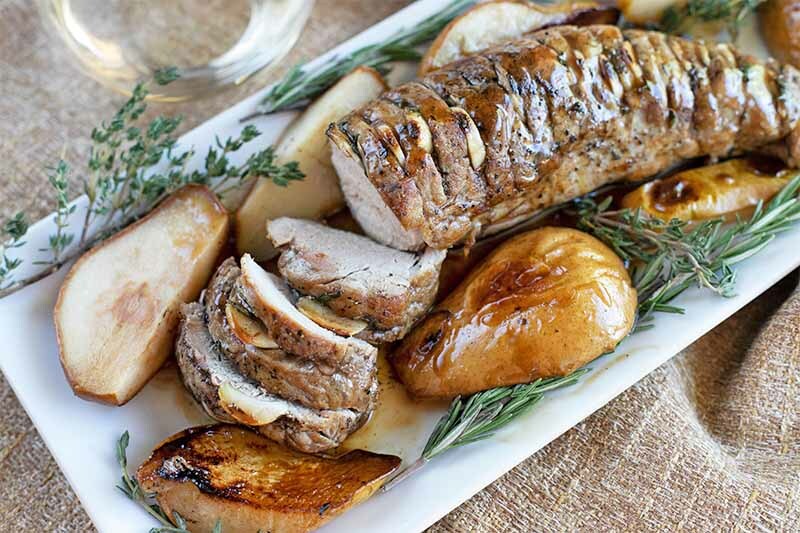 After the pork tenderloin is prepared, you brown the meat on all sides to lock in the flavors of the meat. 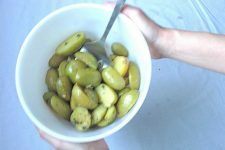 Then, you add pears to the pan and roast the dish in your oven (in the same pan – gotta love one-pot cooking!) until the meat is cooked through. 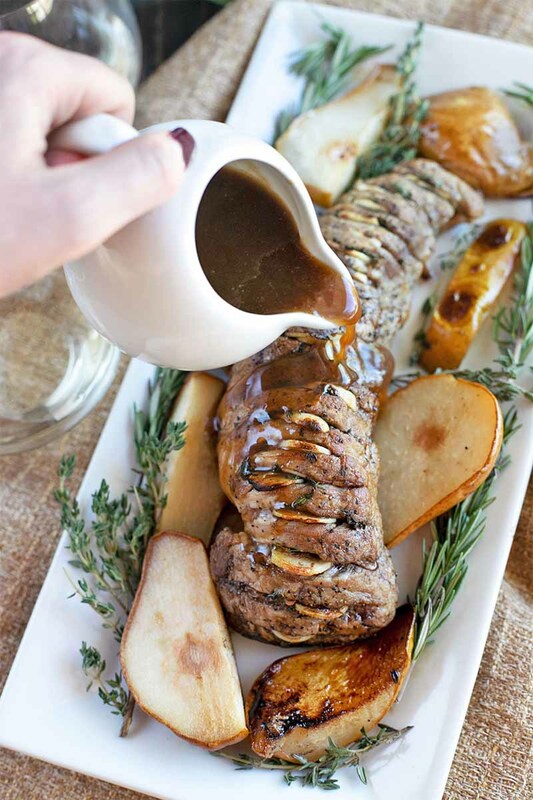 After that’s done, you use the drippings from the meat and the juices from the pears to make a savory pan sauce that will make you want to lick the plate clean. The pan sauce is pure magic, I am telling you. The touch of white wine and fresh herbs really amp up the richness of the sauce, making the entire dish even more indulgent. 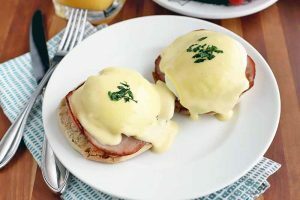 In the end, you get a main entree that is truly jaw-dropping from the moment you place it on the table to the last bite. 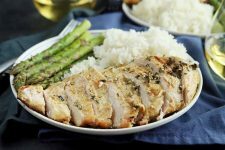 The savory richness of the sauce paired with the garlicky herb roasted pork tenderloin provides just the right balance of flavors. When you add the tender roasted pears, there is a subtle sweetness to the dish that plays against those savory flavors in the best way. 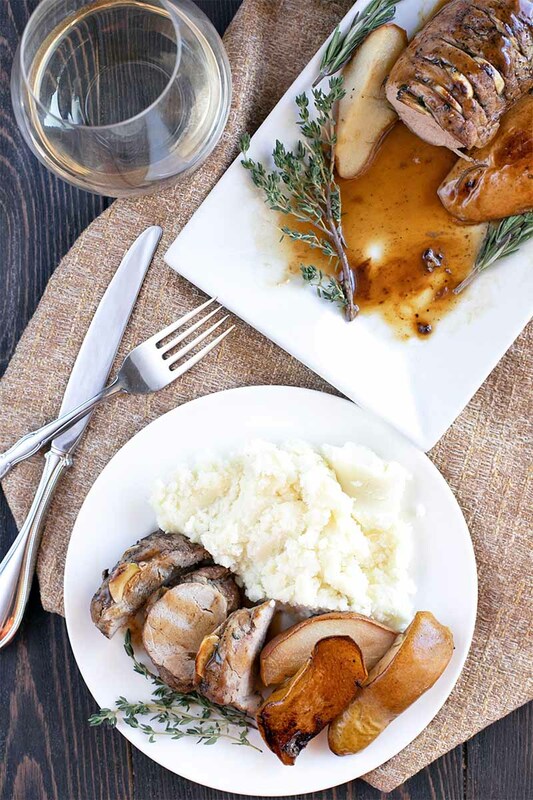 The beauty of pork is that you can pair it with white or red wine. 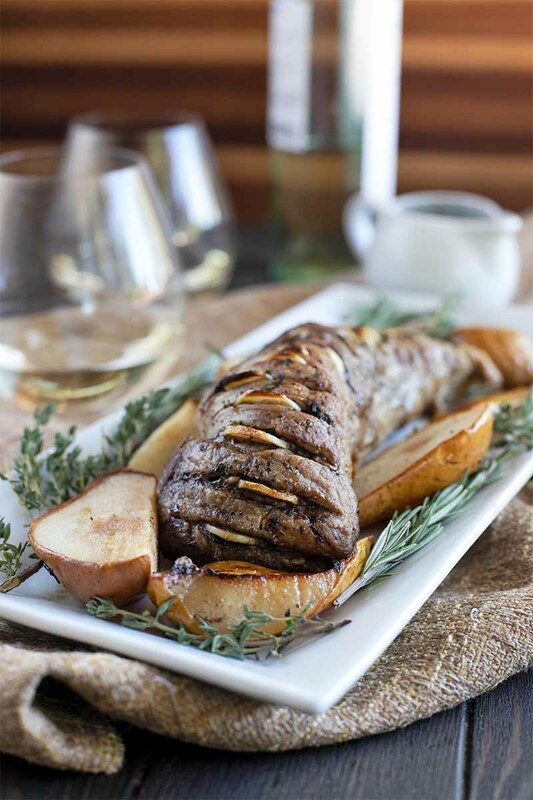 If you are going the white route, I would choose to serve this with the same wine that you use in the cooking process – a pinot grigio, in my case – or perhaps an oaky chardonnay that can stand up to those savory flavors. 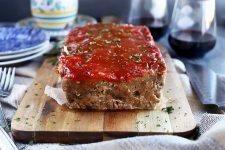 If you prefer a red, I would recommend a lighter one, like a pinot noir that doesn’t overpower the flavors of a lighter meat. 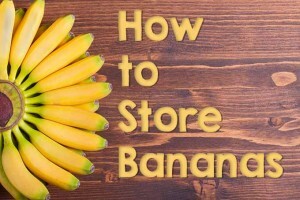 You are going to want to bring out this special recipe for any gathering you have coming up, because it is low stress and simple to make. Despite how easy it is to put together, it packs the flavor and impressive presentation of a fine dining dish. Looking to impress at your next dinner party? 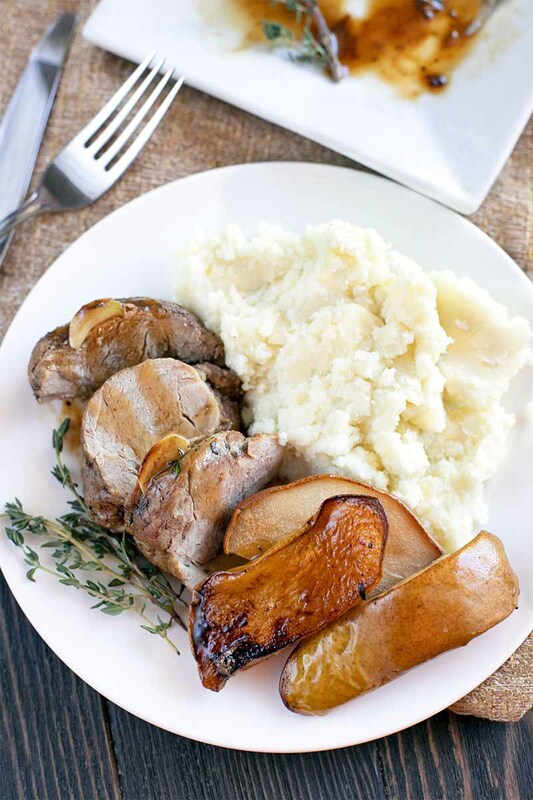 This herb roasted pork tenderloin with pears is the jaw-dropping main dish you need. 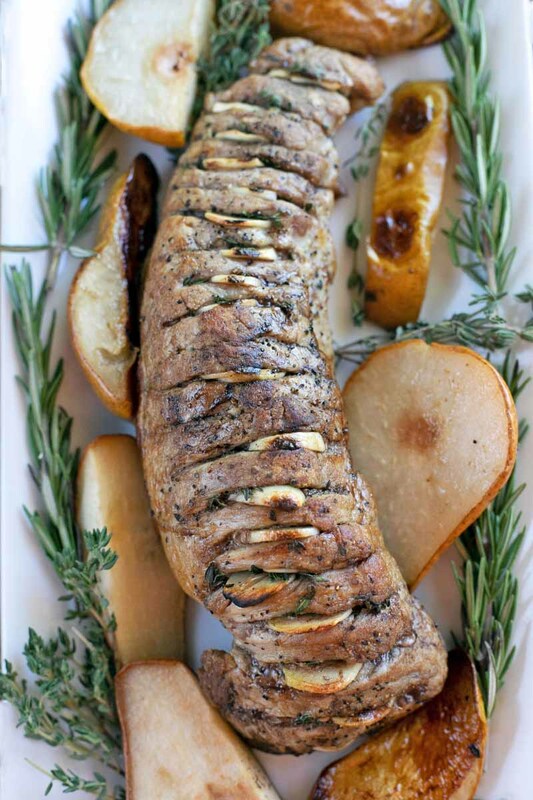 Lay the pork tenderloin horizontally on a cutting board. 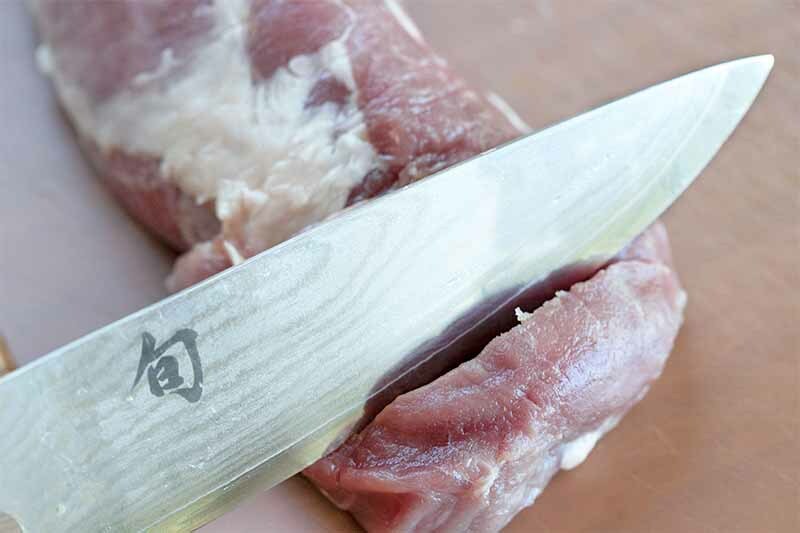 Using a paring knife, cut about 20 slits vertically into the pork. 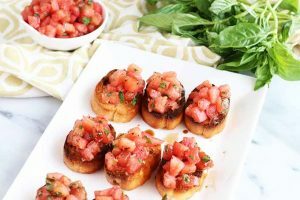 Place a small slice of garlic and a few leaves of thyme into each opening. Sprinkle evenly all over with salt and pepper. Heat olive oil in a large ovenproof skillet over medium-high heat. Add the pork. Cook about 3-4 minutes on each side until browned all over. Add pears to the pan. 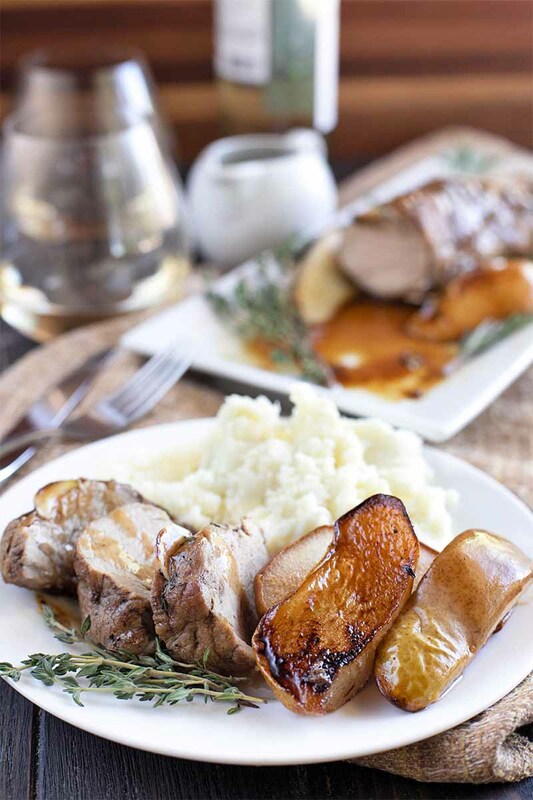 Roast in the oven for 15-20 minutes, until pork registers 160˚F on an instant read thermometer. Transfer pork and pears to a serving platter, and tent with foil to keep warm. Place the skillet over medium heat. 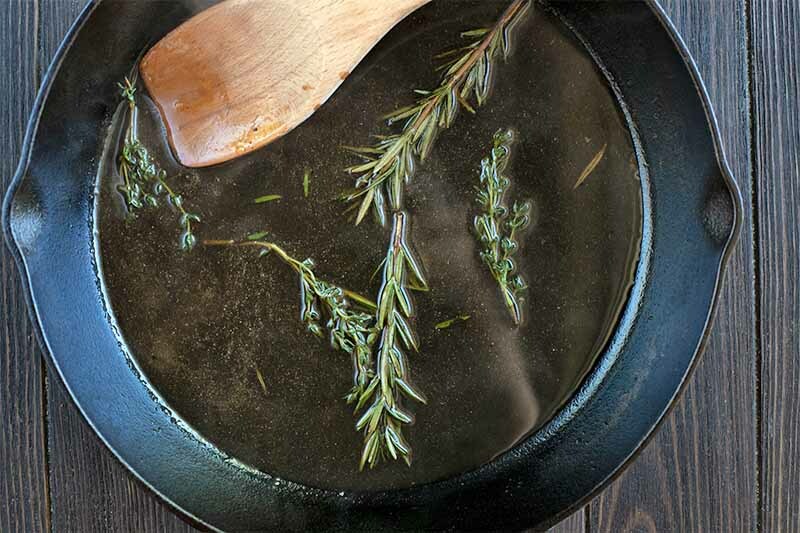 Add wine and herbs to the pan, and simmer for 1-2 minutes, using a wooden spoon to scrape up any fond. In a small bowl, whisk together cornstarch and cold water. Add the slurry to pan and stir to combine. Simmer until the mixture is thickened. Add chicken stock and stir to combine. Simmer for approximately 4-5 minutes, until thickened. Season with salt and pepper to taste. 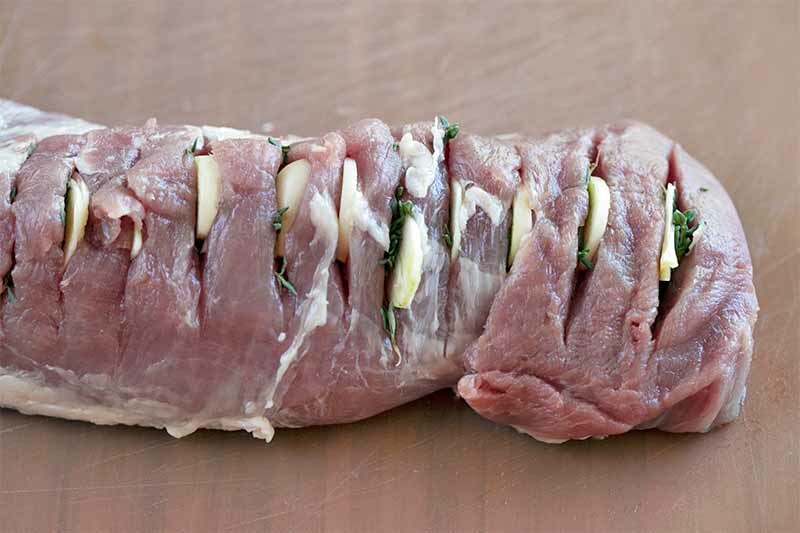 Slice the meat, then serve immediately, with sauce and a few pieces of pear. 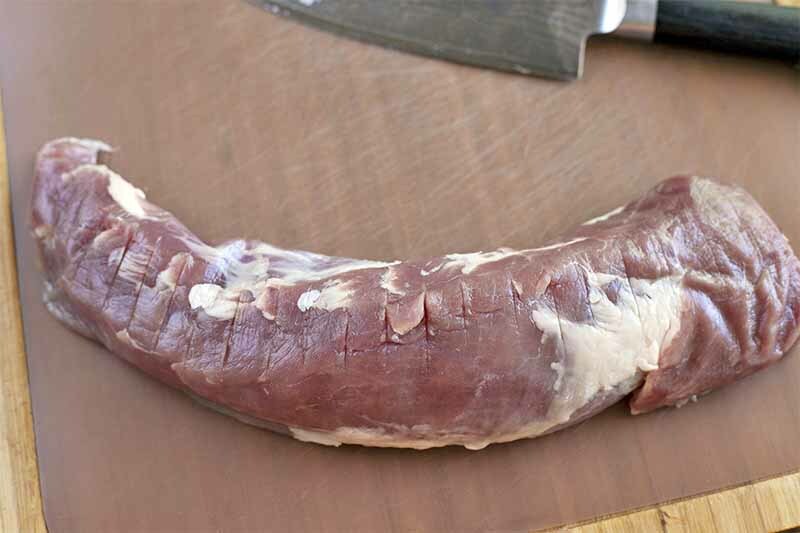 Trim the pork tenderloin of any excess fat. Slice the garlic cloves very thinly, using a mandoline or sharp knife. You should end up with 20 slices of garlic in total. Remove any stickers from the pears, wash them well, and leave the skins on. 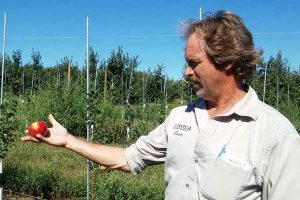 Cut them into quarters, and remove the cores. Measure all of the remaining ingredients as listed in the ingredients list. 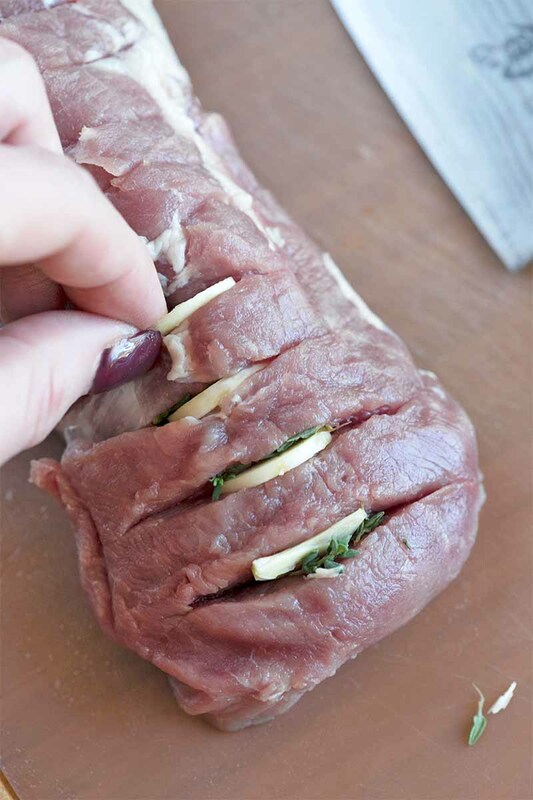 To prepare the pork, place the tenderloin on a cutting board. Use a knife to cut 20 slits in the pork, spacing them evenly. To do this well, I like to score the slits first to indicate where you should be cutting, and then make the final cuts so you can adjust the spacing a little as you go if needed. When cutting the slits, make sure they are not too deep. These should be about 1/2 to 3/4 of an inch deep, cut parallel to each other across the width of the meat. Nestle a slice of garlic into each slit, with a few thyme leaves. Season with salt and pepper. 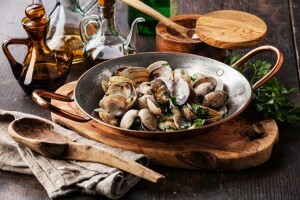 Heat a cast iron skillet or other large ovenproof frying pan over medium-high heat. Add the oil, and once it’s hot (shimmering but not smoking), add the pork. Brown the meat on all sides, cooking for about 3-4 minutes on each side. Add the pears to the pan. 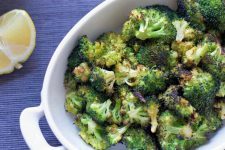 Place the skillet in the oven and roast for about 15-20 minutes. The pork should reach an internal temperature of 160˚F. Carefully remove from the oven (don’t forget, that pan handle is going to be HOT!) 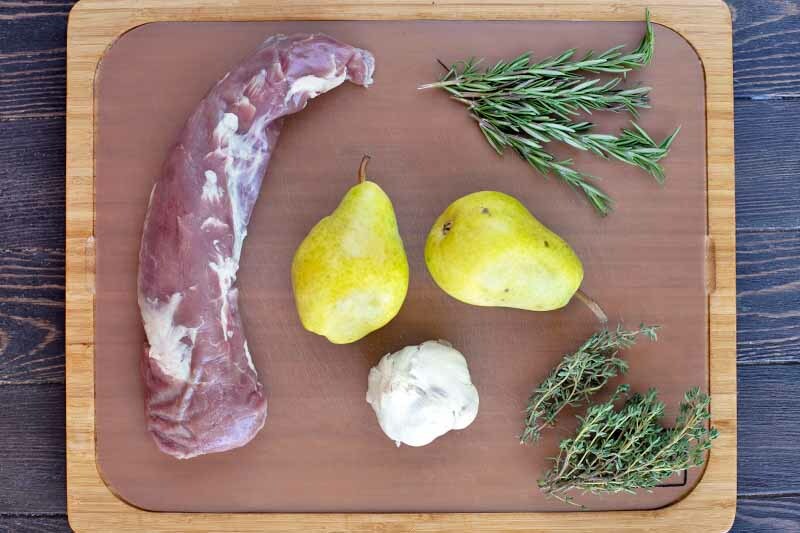 and transfer the pears and pork to a serving platter. I like to tent the dish with foil to keep the meat warm, and let it rest for about 10 minutes before slicing while I make the sauce. Use a wooden spoon to stir and scrape up any stuck-on bits, or what’s known as the fond, from the bottom of the pan. This is where all of the good flavor is, and it’s the key to a delicious sauce! In a small bowl, whisk together the cornstarch and cold water to make a slurry. Add it to the pan and stir to combine. Simmer for a few more minutes, stirring occasionally, until the sauce has thickened slightly. Add the chicken stock and stir to combine. Cook for 4-5 more minutes, until thickened. Season to taste with salt and pepper. 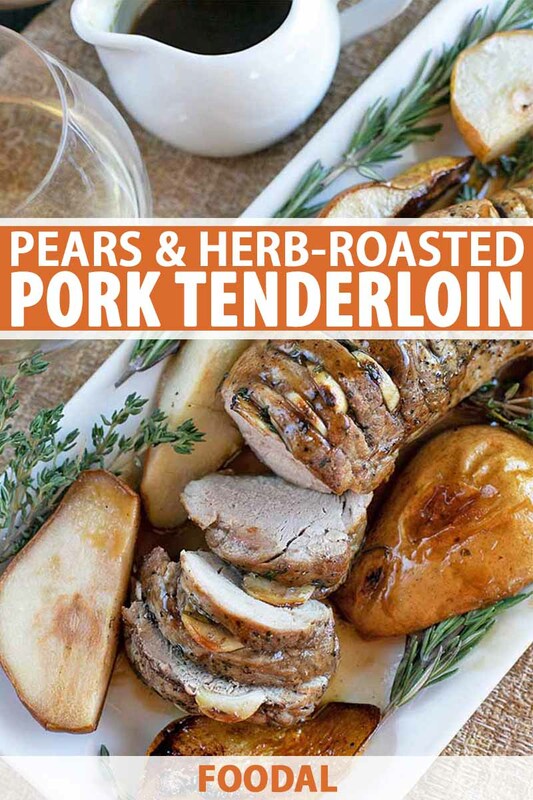 Drizzle the pork with the pan sauce and serve immediately, with the pears. 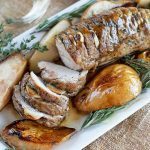 Selecting the best side dish to serve with this roasted pork tenderloin is extremely important. 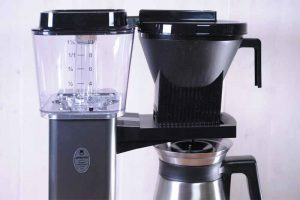 You want a recipe that isn’t too complicated. It also helps that if you select a recipe that is roasted, you can cook both of these recipes in the oven, at the same temperature (and ideally in about the same amount of time). One recipe that accomplishes this one of my go-tos, parmesan roasted green beans. 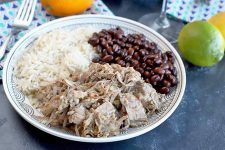 The beans are roasted in the oven at the same temperature as the pork, so you can throw them in while the pork is roasting, or while the sauce is simmering on the stove. You can always turn to traditional mashed potatoes as a side, but I prefer the texture and flavor of quick and crispy roasted potatoes. 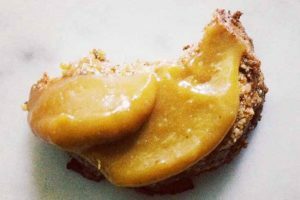 The recipe is so simple, and primarily made in the microwave (yes, really!) with just a quick broil at the end that can be done while you are making the sauce. 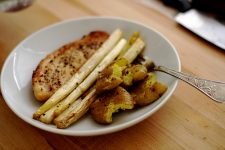 Would you prefer green beans or roasted potatoes to pair with this pork recipe? Tell us in the comments below, and be sure to rate the recipe as well. Photos by Meghan Yager, © Ask the Experts, LLC. ALL RIGHTS RESERVED. See our TOS for more details. Originally published on January 11, 2010. Last updated: November 4, 2018 at 9:43 am. With additional writing and editing by Allison Sidhu.